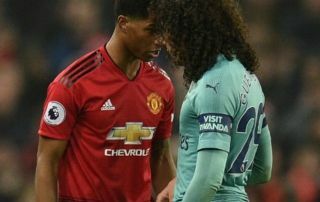 Arsenal starlet Matteo Guendouzi has aimed a cheeky dig at Manchester United midfielder Marouane Fellaini after their coming together in the game at Old Trafford last night. Guendouzi, who has shone as one of the most exciting young players in the Premier League this season, had another strong game for the Gunners in that defensive midfield role. One could forgive Fellaini for looking at him and seeing a younger, better version of himself – not least because of those lovely long locks. Until only recently, the Belgian had a similar hairstyle himself, and that might have played into his mind as he was seen grabbing his opponent by the hair in the second half. This is certainly not the kind of foul play we’d endorse, but it is a bit amusing to see a short-haired Fellaini trying to yank someone else’s afro off as a sign that he might be regretting his decision to cut his off. That’s how Guendouzi saw it, as he gently mocked the United ace after the game.